My sweet husband has come home from work three days this week with fresh blackberries, picked from wild berry patches growing out around his job site. He stayed late in the heat and picked berries, braving not just the heat but the chiggers and brambles, and brought us home quarts and quarts of beautiful fresh ripe berries. All he requested was a cobbler "like his grandma used to make" with two crusts. Now you have to understand, I don't do pie. I do make really good peach or pear cobbler, but those involve making a batter that cooks into a thick, almost cake-like top, nothing like the traditional pie crust style cobbler. So I searched out and found this recipe for blackberry pie and decided to try it. The directions stated to put the berries in the bottom crust, then sprinkle with sugar and corn starch and dot with butter. The top crust I cut in strips and latticed-it---you real pie bakers out there just be quiet, I was really impressed with myself! Then I sprinkled just a little more sugar on top so it would have pretty little sugar crystals on top. I baked it about 35 minutes at 350 degrees. This is what it looked like after it came out of the oven--my son even said, "Wow, mom, it looks like a real pie!" I was so excited, I could hardly wait for it cool off enough to cut into it. Unfortunately, we had to eat it out of a bowl instead of on a plate! It tasted good, anyway--not too sweet, but just sweet enough, especially with vanilla ice cream on top! If I make this again (and I probably will) I'd gently toss the berries with the corn starch and sugar, not put the corn starch on top. Besides not thickening enough, I had a couple of clumps of cornstarch right underneath the top crust that never dissolved. I might even increase the amount of corn starch by another tablespoon. Stay tuned this next week, I'll be sharing even more blackberry bounty recipes as I go! My Hubs would kill for that blackberry pie. It really turned out nice. We love blackberry pie. Yours looks delicious. Blackberries have a high moisture content and it's really hard to get the filling to set. I was impressed with your lattice top. Kudos are sent along with wishes for a lovely weekend. In Belgium we make a lot of fruit pies.They look just like yours with a lattice on top. But as you said yourself, the fault was not to toss the fruit with the cornflower.I wouldn't even toss it with sugar. We make rubarb pies the same way and use no sugar too.We add caster sugar on top just before surving. What you also could do is mix the fruit with the sugar and the cornflower and add 1 egg. That will set this filling too. Myself, I am not a piemaker.My mom is a too good to even try to immitate her. I love to make muffins and cakes and all other foods. I LOVE this recipe. I've got blackberries in the refrigerator and was trying to decide what to do with them today. 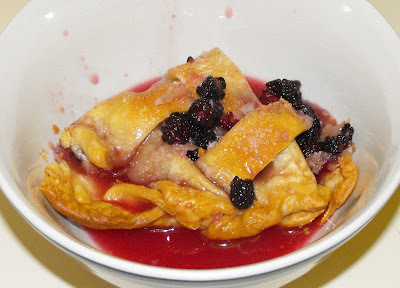 I use frozen pie crusts, too--they are GREAT in chicken and dumplings). Thanks for joining us at FFriday! HE IS THE MAN! Our blackberries are almost ripe, but you're right...it's hot, and there are always a ton of chigger bites to be had, not to mention the prickers. :)Thanks for linking to Tasty Tuesday. This is one of my favorite desserts, especially with ice cream! That looks both pretty and delicious! I've never tried to make a lattice pie crust, but one day I'm going to try. That looks awesome! How lucky to find them to pick. Wow, I don't think I've ever had fresh blackberries. I also have never made my own crust so I'm totally impressed. This looks so yummy. Wish I had some right now! Mmmmm! Looks delicious! My husband loves blackberries so I'll have to give this a try! I learned to make a perfectly flaky piecrust when I was in junior high. I use the same crusts that you do. I love berry pies. I just finished eating a bowl of cherries, but darn it, your pie would have been much yummier. Thanks for sharing this with TATT too! That look yummy and I'm impressed with your latice top!